Barbecued pork ribs is always nice to have whether there’s something to celebrate or simply because we’re craving for meat. It’s lovely to sit outside during the warmer months enjoying the weather while the ribs are getting ready on the grill. When it’s done, pair it with mashed potatoes and salad, and maybe some wine. However, there are times you’re craving for ribs but can’t do barbecue outside. Blame it on the weather, current mood (too tired to start up the grill), and sometimes just for the reason that you want an easier way to do it. The solution is to bake them in the oven. It may not be the exact same taste as one cooked in open fire, but equally delicious. This recipe is so simple with only few ingredients. But the ribs come out tender and full of flavor. 1. Preheat oven to 350ºF or 180ºC. 2. 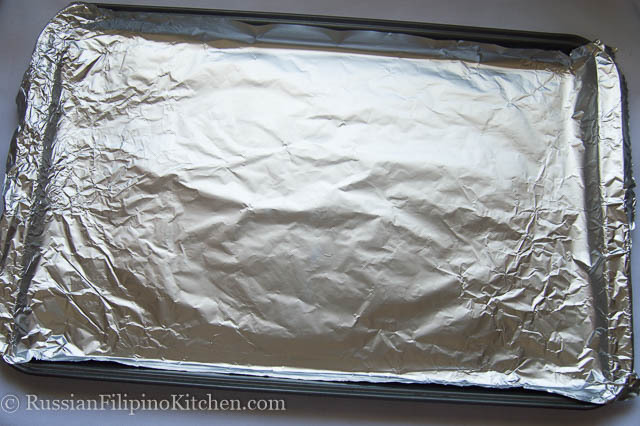 Cover baking sheet with aluminum foil. I do this to catch any barbecue sauce that will leak through while baking. It makes cleaning up a breeze. However, if you’re comfortable with washing and scrubbing after cooking, you can skip this step. 3. 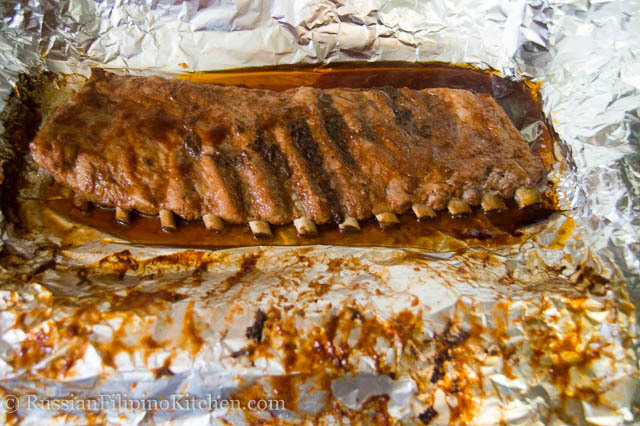 Cut two more sheets of aluminum foil long enough to cover the entire ribs. Align bottom side of foil, fold over and press down flat. This will cause a seal and further stop any leaks. Place on top of the baking sheet. 4. In a small prep bowl, mix together salt, ground pepper, and garlic powder. Place pork ribs flat on one side and season. Drizzle about ¼ cup of barbecue sauce and spread all over the meat using a pastry brush. 5. Carefully flip, season, and coat the other side with ¼ cup BBQ sauce as well. Reserve ¼ cup of the sauce for later. 6. 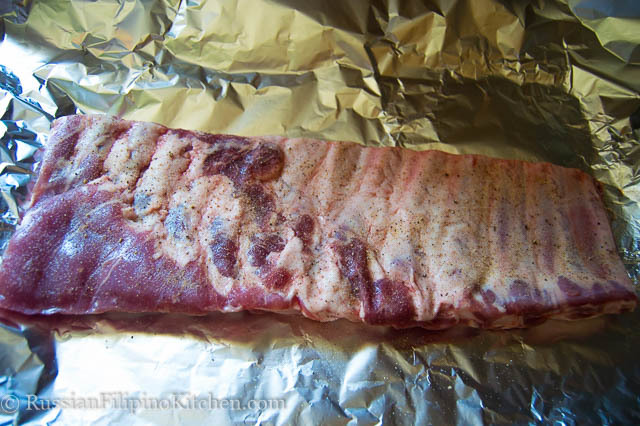 Wrap the ribs with the foil and seal the edges. Place in oven’s middle rack and bake for 1 hour. 7. 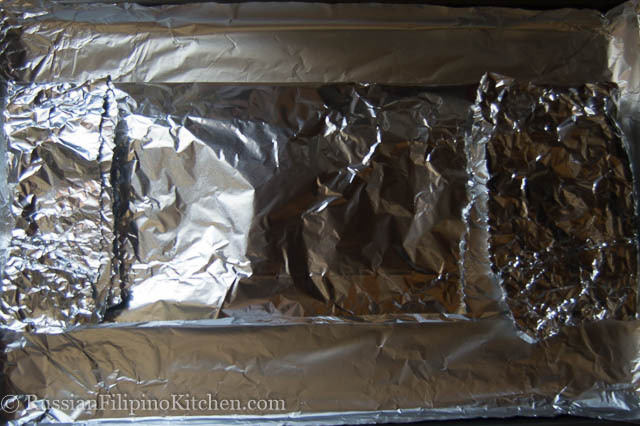 Remove from oven and carefully unwrap the foil. With a fork or knife, poke the meat and check for doneness. The juices should run clear and meat should be easy to cut. 8. Baste ribs with its own sauce and add the remaining barbecue sauce. Bake uncovered for another 15 minutes or until browned. Remove from oven and allow to cool a little before slicing. Note: Just to show how the bottom of the pan looks like after baking, here’s a photo below. It’s very clean as you can see, without any trace of leaking barbecue sauce. This will save you time cleaning and scrubbing the pan and also extends its life. 9. 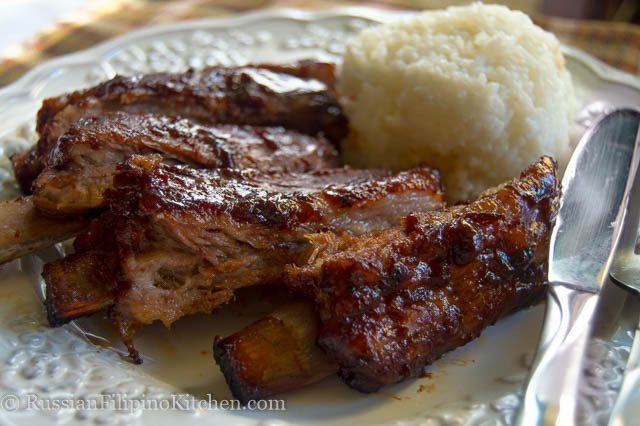 Serve pork ribs with bread, rice, pasta or mashed potatoes. 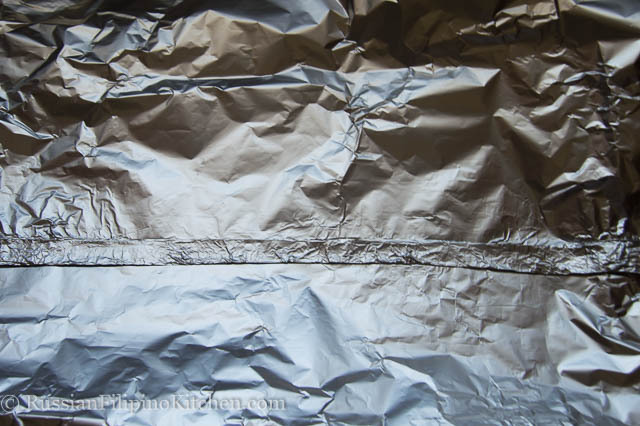 Cover baking sheet with aluminum foil. I do this to catch any barbecue sauce that will leak through while baking. It makes cleaning up a breeze. However, if you’re comfortable with washing and scrubbing after cooking, you can skip this step. 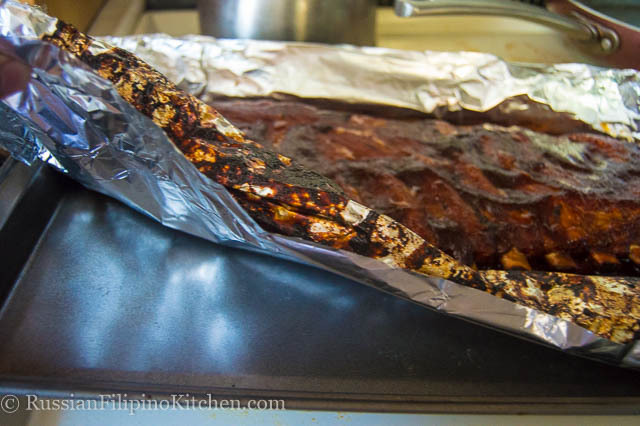 Cut two more sheets of aluminum foil long enough to cover the entire ribs. Align bottom side of foil, fold over and press down flat. This will cause a seal and further stop any leaks. Place on top of the baking sheet. In a small prep bowl, mix together salt, ground pepper, and garlic powder. Place pork ribs flat on one side and season. Drizzle about ¼ cup of barbecue sauce and spread all over the meat using a pastry brush. Carefully flip, season, and coat the other side with ¼ cup BBQ sauce as well. Reserve ¼ cup of the sauce for later. 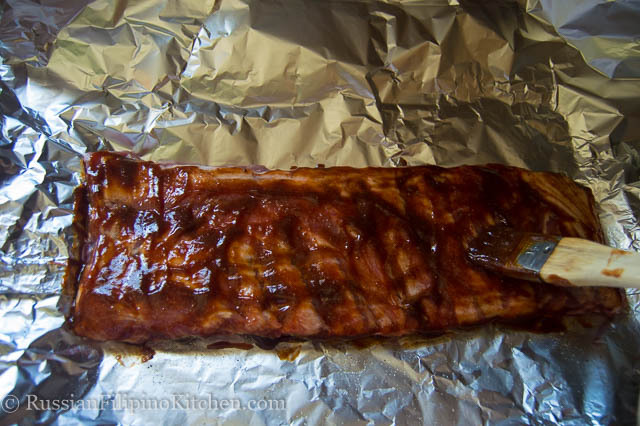 Wrap the ribs with the foil and seal the edges. Place in oven’s middle rack and bake for 1 hour. Remove from oven and carefully unwrap the foil. With a fork or knife, poke the meat and check for doneness. The juices should run clear and meat should be easy to cut. 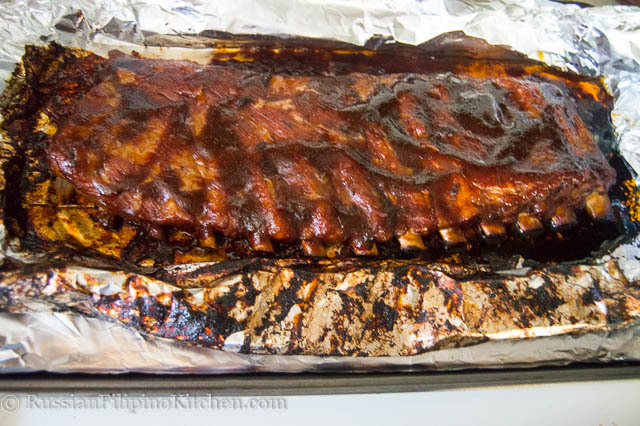 Baste ribs with its own sauce and add the remaining barbecue sauce. Bake uncovered for another 15 minutes or until browned. Remove from oven and allow to cool a little before slicing. 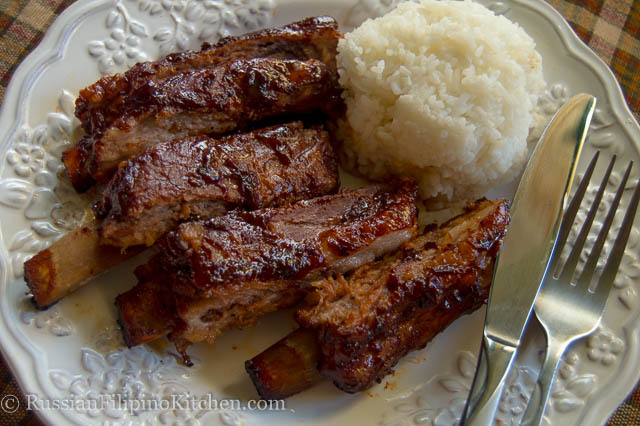 Serve pork ribs with bread, rice, pasta or mashed potatoes.